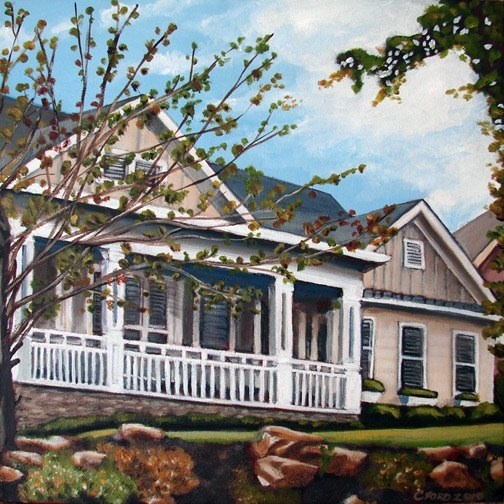 So here’s the 12” x 12” painted canvas, the Bigley House. I don’t do buildings typically, unless its used in part of the background of the overall composition. The photo I worked from was a good source image to start with, its my technical ability at rendering multiple parallel lines consistently comes into question. It was never my desire to do an architectural rendering, one with absolute technical accuracy. And while the painting looks like the building in question, my somewhat impressionistic, painterly style doesn’t seem to suit the subject matter in my opinion anyway. Hopefully the patrons will like it. I’m on to the next project.